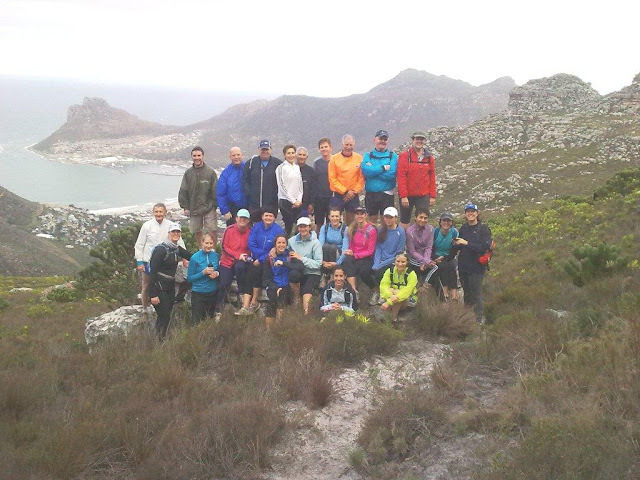 29 runners turned up in the dark of a damp mid-winter morning for our group run along an exploratory new route which proved to be a mix of running, scrambling and hiking - amidst spectacular views of both Hout Bay and the Constantia Valley. 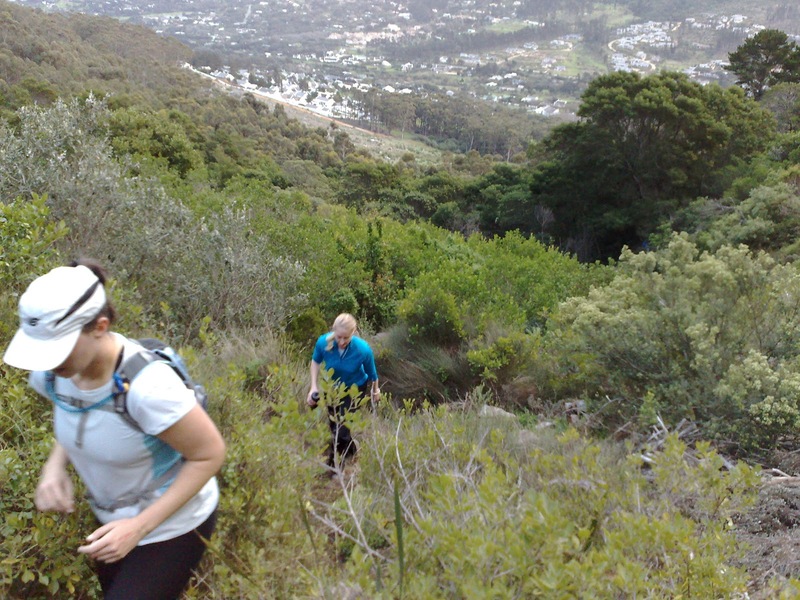 After a gentle jog along the pipe-track from Constantia Nek towards Hout Bay, we undertook a challenging uphill scramble through the fynbos thickets of Bokkeman’s KIoof en route to the Hoerikwaggo footpath. 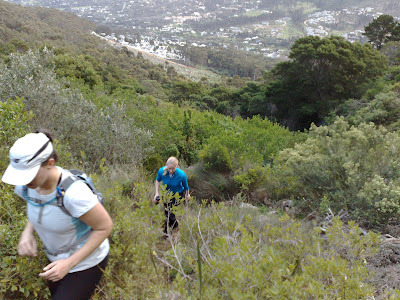 Warnings by the locals that the so-called path was overgrown proved true, making the ascent all the more taxing! Fortunately, the rain held off and the wind gave a very faint-hearted performance. 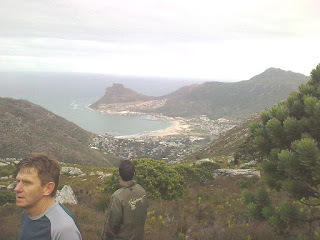 Once on the footpath, it was some more uphill over the northern flank of Skoorsteenberg before reaching the tarred road and then the mostly flat, sandy and runnable trail to the lookout point above Hout Bay. Our return was along the Hoerikwaggo trail up and over Vlakkenberg down to Constantia Nek. But, other than scratched legs here and there, we had no takers for the Jungle-Joe award and no serious mutinous mutterings were heard. 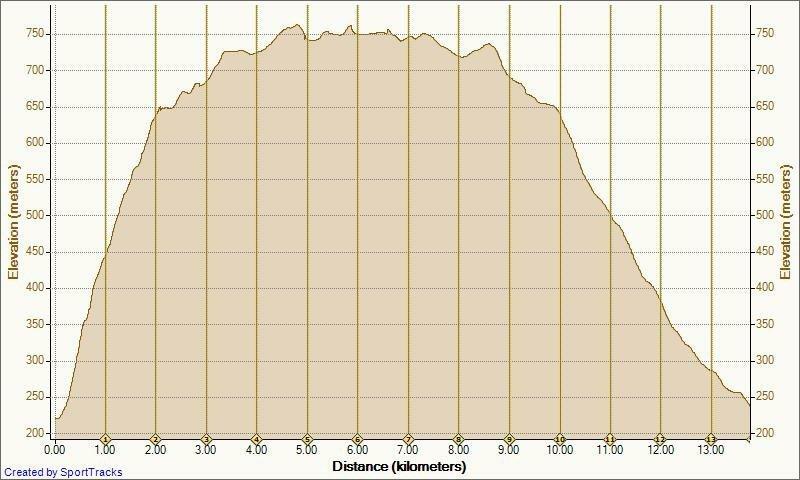 The only drawback of this route is that there is not as much runnable track as we usually get - but it was different and that’s all part of the allure of trail running! 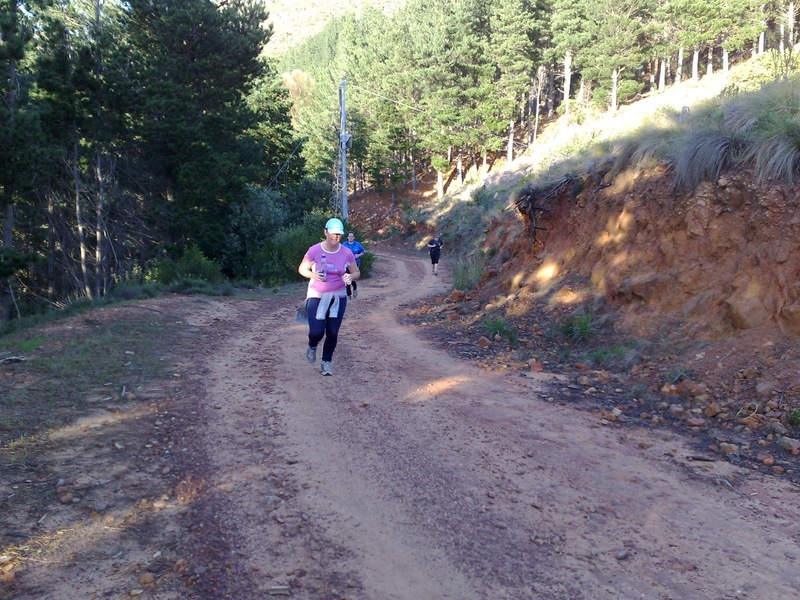 The joy of trail running! 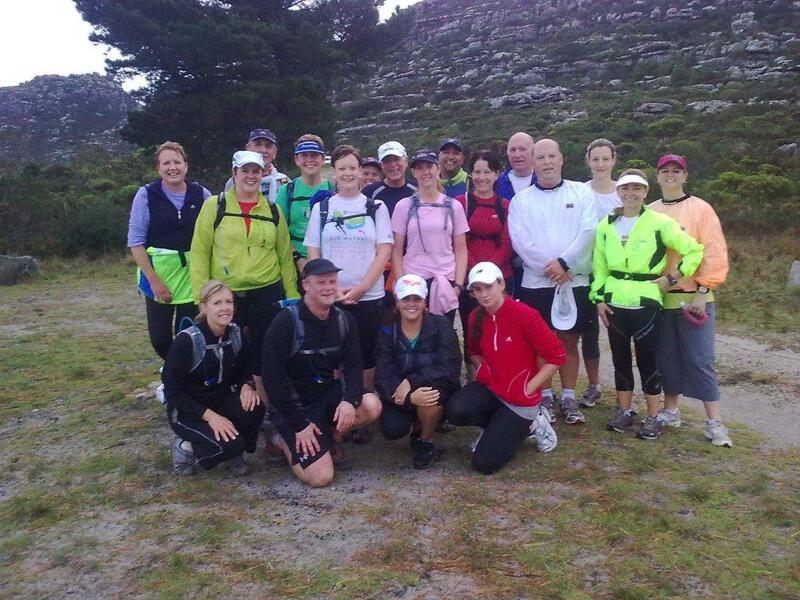 This past Saturday’s run across the face of Constantiaberg was billed as a good run for beginners, and whilst much of the run was indeed flatish, the gruelling hike up to Level 5 was seriously challenging for even our experienced runners! 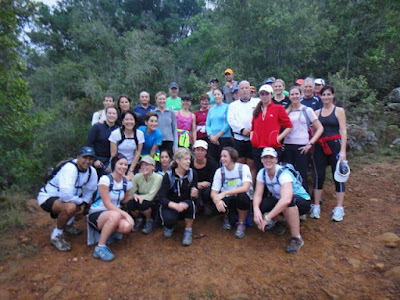 The angry voices of baboons echoed in Tokai’s Arboretum as 28 of us followed Seamus as we set off that cold morning, but the inevitable chirping and chatter was soon replaced by squeals and laughter as we took turns to ford a riverlet in spate. 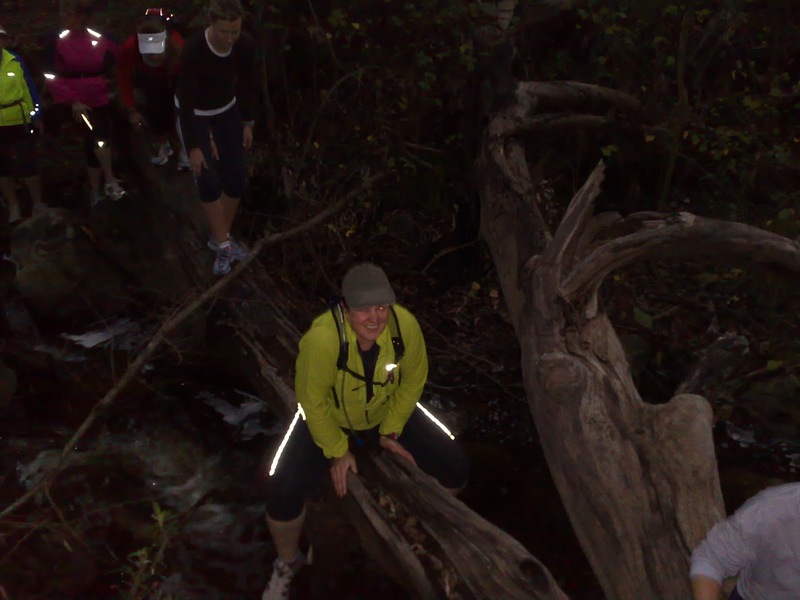 Although Sue-B showed style in method on the fallen tree over the river, Felicity wins the prize for innovation – using a branch as a punt, she resembled the Boatman crossing the Styx. We then made our way up to Level 5, tackling gradients and track that were demanding to say the least and tempered only by the magnificent views of the Constantia Valley and beyond that were unveiled at every turn. The spectacular corner waterfall awaited as the track straightened out, and thereafter we ran in dappled sunlight, soaking up the unique smells of a damp forest. Then, at last, it was downhill as we zig-zagged our way down to Level 1 and back to the parking area via the enchanting Fairy Forest. We had a huge turnout - 34 people signed the register. Unfortunately Faye only had Murphy to keep her company. We did a 'mystery' route within Newlands forest. Gregg and Kerry were happy to be up front, and Veronica and I stayed in the middle, with Sam being sweep. We regrouped often to discuss which path to take, and although we didn't quite do the exact Two Ocean's trail route, but we did manage to do 10.38 km. 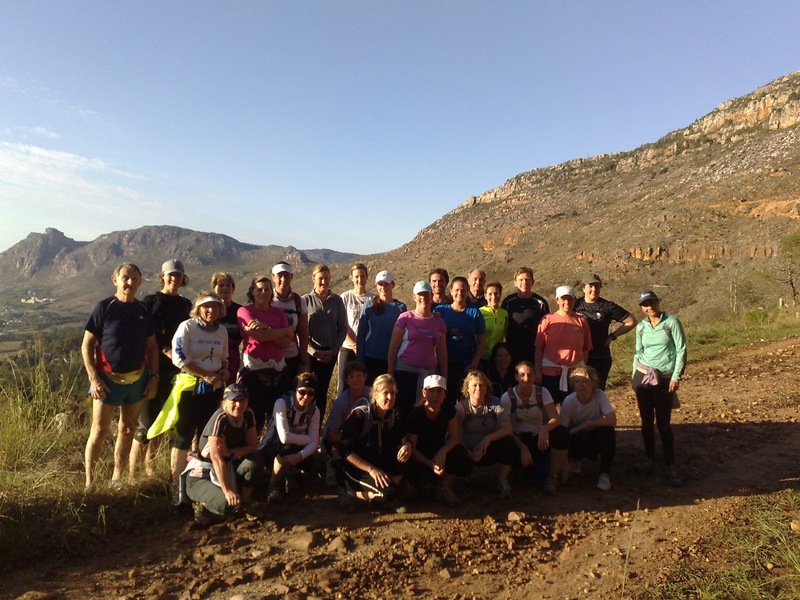 Quite a few new people joined us. 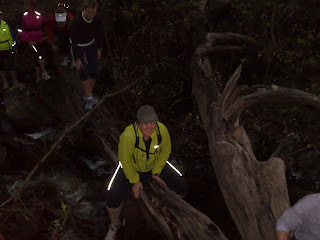 Unfortunately Veronica slipped off the path and twisted her knee, but she was able to stay with us and complete the run. 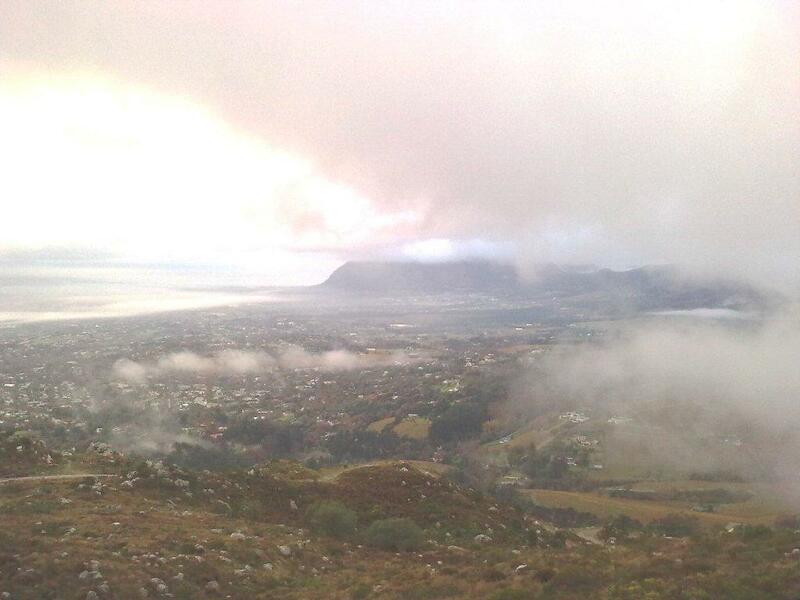 Ignoring the threatening weather 19 of us drove up to Constantia Nek where predictably it was raining. 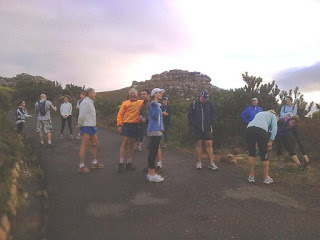 Despite several enquires as to "do we actually start in rain"? the matter was resolved when the rain eased off and we set off up the two short-cut paths which run directly across and up the the slopes of Klassenkop. A good early morning workout for slumbering calves. 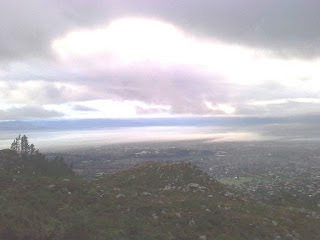 Soon we broke though the cloud and witnessed a colourful sunrise towards the East. That is those of us who stopped long enough to look around. Soon we reached the concrete track and the very steep section to the "iron bridge" actually I think its made of steel but so what. 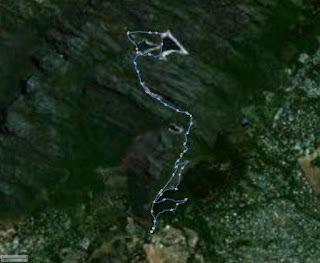 Here the track flattens out a bit and running was possible just. 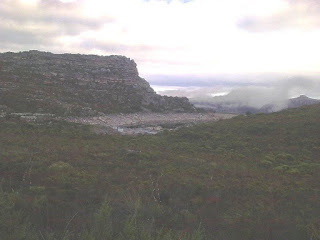 Past the old Oveseer's lodge now an overnight stop for Hoerikwaggo hikers and on past the Alexandra and Victoria dams. 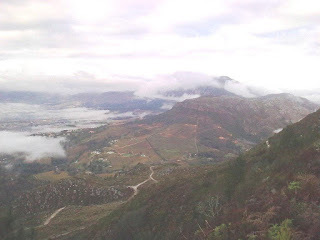 On arrival at the trees overlooking the Woodhead dam we realized we had only covered 4.8 Kms. Not good enough so on around the dam and back over the wall with its spectacular view down into Disa Gorge.